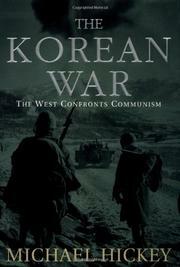 A British officer’s history of the events of “The Forgotten War” in Korea. Hickey (The Unforgettable Army, not reviewed), a Korean War veteran, reports on the main events of a war fought amid the extremes of sub-zero cold and exhausting heat. The US Army was taken by surprise when the North Korean Army crossed the 38th parallel in 1950, and it lacked combat readiness after five undemanding years of garrison duty in postwar Japan. Together with unreliable Republic of Korea troops they were thrown into the bloody cauldron of combat against a prepared, ruthless enemy—and almost driven into the sea after a panic-filled retreat, until a reinforced defensive line finally held at the Pusan Perimeter in southernmost Korea. MacArthur’s brilliant landing at Inchon, plus a renewed UN allied offensive saved the day. But, as everyone knows, MacArthur ignored the orders of President Truman and the Joint Chiefs of Staff, driving relentlessly to the Yalu River at the Manchurian frontier. Truman, fearing another world war with China and the Soviet Union, replaced MacArthur with General Ridgway after massive Chinese armies entered the war and forced UN forces to retreat. Hickey notes the heroic performance of the US Marines, their engineers, and the US Air Force at the Chosen Reservoir. Ridgway rallied his troops after the famous “bug out” of US and Allied troops before the huge numbers of Chinese, and he stiffened the UN lines before the long stalemate during the peace talks and the bloodletting at Pork Chop Hill. Hickey dwells at length on the experiences of the British and Australians, although the US contributed most of the manpower, supplies, and air and naval power that decided the war’s end. Hickey’s viewpoint is that of the commanders and has little to relate about the grunts on the firing lines who suffered and died, so the reader does not get the tragic sense of the terror, heroics, and high emotion of combat. His approach suggests the reporting of a staff officer in the rear—out of harm’s way. Hickey’s text is clear and concise but falls short of a definitive history of the Korean War—too much is left out to justify the title.